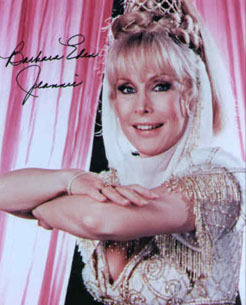 Barbara Eden was a genie in a lamp in the 1960s sitcom I Dream of Jeannie, with Larry Hagman as her "master" and later husband, the astronaut who freed her from her bottle. The series was amusing and Eden was adorable, but her minimal costume left her navel exposed, and that was considered so racy, network executives insisted that her belly button be filled in with putty. Eden was a high school cheerleader and won the Miss San Francisco beauty pageant at 17. She was 19 when she first appeared on network TV, with a bit part on Ann Sothern's long-running sitcom Private Secretary. Through the mid-1950s she appeared on TV shows from Highway Patrol to I Love Lucy, and in 1957 she was given her own sitcom, How to Marry A Millionaire, based on the hit film, with Eden in Betty Grable's role. On the big screen, her best-remembered roles are from the cheesy sci-fi Voyage to the Bottom of the Sea and George Pal's delightful 7 Faces of Dr. Lao with Tony Randall. A few years before I Dream of Jeannie, she co-starred (with Randall again) in The Brass Bottle, a comedy with a magic lamp premise, but the genie was Burl Ives. After Jeannie, she starred on stage as The Unsinkable Molly Brown. In an amusing 1971 TV movie, The Feminist and the Fuzz, where the titular feminist (Eden) and a policeman (David Hartman, later host of Good Morning America) were forced to share an apartment. She later starred in a short-lived TV series, Harper Valley PTA, based on the novelty pop hit about a mother called to account for wearing "dresses way too high" and "drinking and a-runnin' 'round with men". Eden's son, part-time actor Matthew Ansara, suffered from chronic depression and died of a heroin overdose in 2001. Eden made numerous appearances on assorted talk shows in a celebrity anti-drug scold.